NEW Cutting Edge Technology Now Available right HERE IN FLORENCE SC! It has been proven that healthy cells are a key in the healing of all disease. What if we could take your unhealthy cells and rejuvenate them, into healthy ones again? WE ARE NOT TALKING ABOUT STEM CELLS, which are extracted from one source and transplanted into another. We are dealing with your own cells that need to be regenerated. This new state of the art, revolutionary technology can change your life ! Check out our PEMF Testimonies under the "Testimonies" Tab located on this Website. Over 25 years ago the FDA has approved PEMF for bone healing and depression. When God made the world He made it to be held together by electromagnetic fields. Our bodies are electromagnetic and every function is an electrical event, which starts in our brain and travels through our nervous system. We have over 45 miles of nerves in our body. Our bodies are like batteries, our cells have a measureable electrical gradient which is vital in their ability to repair an injury & fight off disease. When our cells are adequately charged our cells can perform tasks like injury repair much quicker & with higher levels effectiveness. How does our cells gradient energy become low? Our bodies are DC current, and should be plugged into the earth. AC current (lighting, laptops, cell phones, TV’s) is everywhere draining our DC current. Our PEMF therapy will specifically target the compromised part of the body and significantly increase the electrical gradient of your cells thus considerably improving the cells ability to repair and heal. PEMF is like a battery charger for the human cell. Another reason why PEMF is so effective at Advanced Injury Repair & Rapid Reduction of Inflammation is that not only does the electrical gradient of the cell radically increase, but the cell pulsation pumps out toxins. As the cell detoxifies itself, it pumps fresh oxygen, fresh blood and lymphatic fluid into the cells of the injured / diseased area. PEMF – Does not move structure, therefore if you have a subluxation (pinched nerve) or other structural misalignment, Dr Donna can take care of that through natural chiropractic care. PEMF – is NOT a medical device. It is an exercise machine for your body’s cells. What is this new therapy in our office? The MagnaCharger is the latest innovation in Pulsed Electromagnetic Field, PEMF, therapy. The Russians and Eastern Europeans have successfully been using similar technology over the past 30 years, but in the U.S. it has only been available for about five years. To sum up the true potential of this exciting technology in a single sentence: The MagnaCharger is the most advanced injury repair and pain elimination technology in the world today. Allow us to explain how it works and why we believe it will change the future of natural medicine, as we know it. One patient can try a natural therapy and experience results almost immediately, while another patient doesn’t feel any positive change for weeks or even months. One of the biggest differences between these types of patients is the level of energy inside the cells. Each cell needs a certain amount of energy to make the needed repairs or benefit from the healing modality. It doesn’t matter what kind of therapy you perform, if cells don’t have enough energy to function, the therapy won’t work well. Though we practitioners have understood this for years, what to do about it has eluded us...until now. Pulsed Magnetic Cellular Exercise, or PMCE, increases your cells’ electric membrane potentials. But what does that really mean for you? Think of it this way – every cell in your body is a small, electrical battery that is constantly conducting a current. Cells use this current to take in essential nutrients, excrete waste and communicate with each other. How well your “batteries” are charged is inevitably going to determine how much work your body can accomplish. 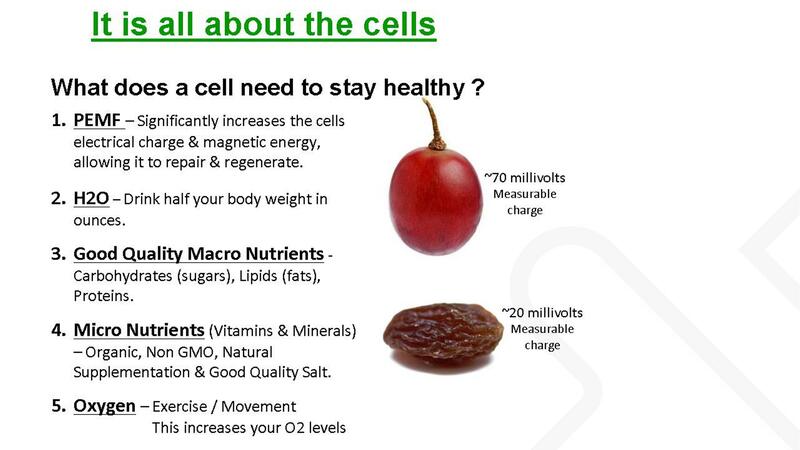 And how much work your cells perform has a direct impact on your health. How Does The MagnaCharger Work? Supplies - Supplies are your cells nutrition. Your cells build with nutrients, and each cell needs nutrients to work. The quality of the supplies directly affects the quality of the house. You wouldn’t build a house with weak wood or flimsy straw, and your cells can’t build or repair your body with poor nutrients. A clean working environment - In order to build a solid foundation, you would first remove the trees, shrubs, large rocks and other debris from the work area, creating a clean work environment. This debris represents the toxins in your body. You cannot build on toxic or uneven soil. Power - Finally, you need Power. The workers’ power tools run on batteries, which represent the batteries in each of your cells. If you don’t have enough charge, the tools don’t work and the house can’t be built. 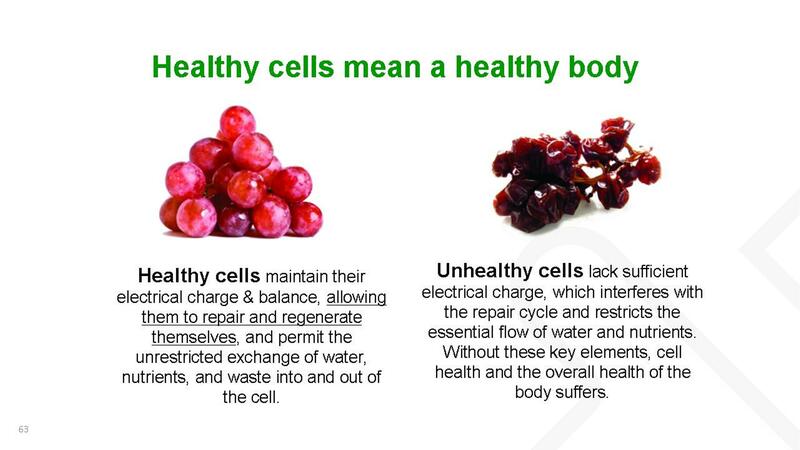 A perfectly healthy body has the ability to naturally maintain a steady supply of “power” to its cells’ batteries. However, most people are bombarded with numerous stressors from the modern world that prevent or block this natural flow of energy to the cells. Exposure to DC electricity, stress, poor nutrition, stress, insomnia, lack of exercise, dehydration and more can all impact your body’s capacity to renew its power. Let’s think about what would happen to this work crew if you cleared the land, gave them all the supplies they needed, such as blueprints, tools and payment in full, but were unable to charge the batteries in their power tools? Not much work could be done. You’d have a crew with potential, but no power to cut wood, build a frame or put up walls. This is the missing link in patients’ “cellular health,” and the MagnaCharger can bridge the gap. The MagnaCharger “recharges” your cells’ batteries. With fully charged power tools and the right supplies the crew is now ready to get to work. How much PMCE will I need? How well hydrated the tissues are - Hydration refers to whether or not you have enough healthy water and electrolytes in the areas surrounding the cells. The battery ‘age’ does not necessarily refer to a person’s biological age, but rather the amount of wear and tear the cells have endured. Think about your cell phone. A cell phone with a two year old battery is not going to hold a charge as long as a phone with a new battery. However, one person’s two year old battery can be much more “used and abused” than another person’s. The age or damage to the batteries - Your cells’ batteries may need a charge once per week or three times per week depending on your goals. The length of therapy depends on the amount of work that needs to be done. Are you building a new deck or a whole new house? The next question that needs to be addressed relates to a patient’s pain levels. He or she will soon notice that MagnaCharger therapy rapidly decreases or eliminates pain. The question is, “My pain is all gone, am I done now?” No, you are not. Pain is simply a signal from the body for more energy. When the workers run out of charged batteries, they aren’t able to complete their work, so it builds up. They are also sitting around with nothing to do they become grumpy and start to complain. When you charge their tools the complaining stops and they go back to work. First they have to get to the backlog of tasks that have piled up, so they need power support during this time. If you stop charging the tools before the work is completed, the complaining – i.e., the pain – will resume. Does the MagnaCharger make other modalities/therapy obsolete? Not at all. As explained above, your cells need supplies, a clean environment and power to accomplish their tasks. Pulsed Magnetic Cellular Exercise simply alleviates the biggest stumbling block to most people’s health goals. In addition, it works well with your other therapies, amplifying their effectiveness. Share this information with anyone and everyone you know that has a new injury, chronic injury or pain that hasn’t responded well to other treatments. Pulsed Magnetic Cellular Exercise also holds great promise for those with fatigue, sleep disturbance, anxiety, depression and more. I let each of my patients try one 10 minute session for free, just to show them what a difference the MagnaCharger makes. When they see the results, they’ll want more. Question: Is it effective ? Is it safe? PEMF has been used in Europe for over 40 years. The FDA has approved PEMF for bone healing and depression. Question: What does the machine do? Short Answer : It produces a variable pulsating electromagnetic field, which improves cellular metabolic function. The Cells within this variable pulsating electromagnetic field are being exercised and the cells that have low energy can be felt as a mild discomfort or slight pain. Higher energy cells are being exercised but may not be felt. While these low energy cells are exercised they are beginning to have toxins permeate out their membranes and therefore the PEMF unit helps to detoxify cells. PEMF's are like a spark plug or catalyst for energy production in the cell. Just like a car needs oxygen, fuel and an ignition (spark plug), so does the human cell need fuel (glucose), oxygen and a "spark plug" or ignition. This ignition is PEMF or pulsed magnetic energy. 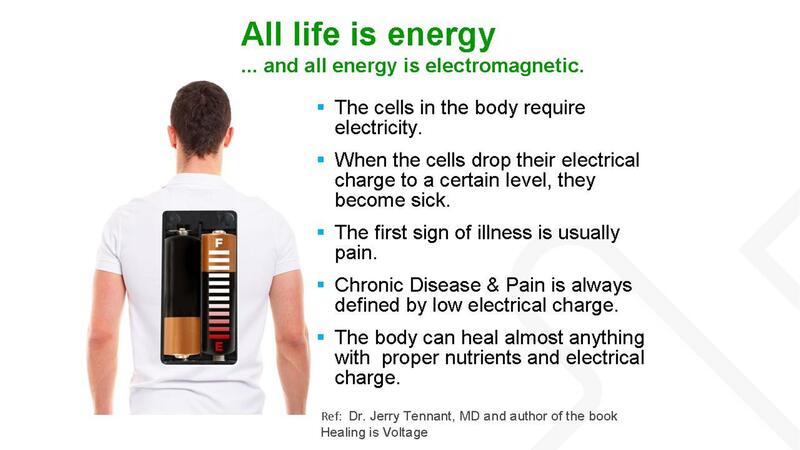 We can also think of PEMF as a battery re-charger for the human cell. We now know that the voltage of a healthy cell is about 70 millivolts. When we get sick or have damaged cells, these cells have been known to operate at 30 - 15 millivolts or less in cases of cancer, or cell / body death. Pulsed electromagnetic fields (PEMF) act like a catalyst and battery re-charger for the human cells and these PEMF's are critical for human metabolism. PEMF's also improve microcirculation, oxygenation (up to a 200% increase), help in nerve regeneration, pain management and many other health promoting benefits. There are over 1000 clinical studies and over 7000 research papers validating the therapeutic benefits of PEMFs.